I ate far too many meals out this week, but most of the time I used my calories wisely. Above is the exception. 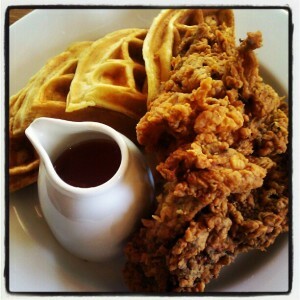 The photo was taken of my chicken & waffle (no bacon) lunch at Inspiration Kitchen. Chicagoans, take note: this is not only a place to get a delicious meal, but by dining there, you are supporting a wonderful cause. I got to witness another awesome cause in action right before my co-workers and I ate lunch there: Fresh Moves. Fresh Moves is a converted CTA bus that serves as a mobile produce market that goes from food desert to food desert, supplying affordable vegetables where there are none available. My birthday is coming up on 5/10. I don’t want anything for my birthday, but if you want to spend money on me, please donate to Fresh Moves here instead. This week, my friend Brandy said goodbye to the midwest and headed down to San Antonio for a new job that sounds perfect for her. It seems like a mass exodus is happening with friends/acquaintances leaving the Chicago-area. Everyone has good reasons, but what a bummer! I am once again at my lowest weight. I swear to you, if you want to lose weight, My Fitness Pal, helps so much! Holding myself accountable is what has really worked for me. Also, having my friends egg me on has been motivational. Also of note: We went to see our friend Derek’s theatre company, Chicago dell’Arte perform Comm-80s-a. A very fun and short show if you loved 80’s movies and well-choreographed dance numbers! This week there was only one dud and it was Leaves of Grass. Every other movie was fulfilling and worthwhile in different ways. Edie & Thea: A Very Long Engagement was the clear winner this week. Seeing people so genuinely in love makes me so happy. I bawled my eyes out. Anyone who believes that being gay is a “choice” should see this movie. It is rare that I see straight people love one another the way that Edie & Thea do in this documentary. If you like food history, then you should see Candyman: The David Klein Story. David Klein got the short end of the Jelly Belly. Zachary and I went to the Jelly Belly factory in WI and they literally had written him out of their history on the tour we went on. David Klein has a new gourmet line of jelly beans here if you’d like to support the real genius with the jelly belly. This happened on Friday night. I was thrilled to finally have been able to celebrate Rachel S.’s birthday with her for once. This time of year there are always heaps of birthdays and for some reason I have never been able to make it to one of Rachel’s for some reason. Friday night her bday plans were ice cream at Margie’s and then dinner at Lazo’s, but Z and I had to skip dinner to make it to Amy F.’s bday drinks at Matchbox. 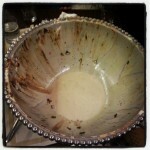 So, my dinner was ice cream. Rachel and her friend Molly got the KING GEORGE at Margie’s Candies. 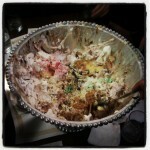 Photographic evidence above that we ordered and finished the 30 scoop behemoth. 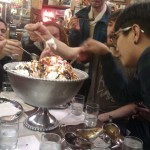 Not sure how many people actually ended up digging in. My guess was 12-15, but Z guessed 20? It took 28 minutes. Also this weekend was Record Store Day. Record Store Day has caused a lot of debate between me and my boo and my friends. Sure, I was excited that Numero Group was doing their pop-up shop right down the street from us at the Bottle, but then I read this that Patrick from Saki had posted and my opinion changed. I love the label. I love what they are doing for vinyl. My first Chicago friend, Dustin Drase, now works for Numero. I love the owners. Tom is our neighbor, which we just found out last week when we saw him walking his dog. However, I completely empathized with Patrick’s post. Money spent at the Numero pop-up was money that could not be spent in a record store on that day. I worked at an awesome record store in the early 00’s. It was called Now! Music and Fashion in Arlington, VA. It was everything a record store should be and it started off great, but when the neighborhood started turning over and people stopped buying, it went through two moves and then it died. Things are different today and Chicago is home to such amazing record stores that all seem to be doing okay. Sure, there is not a ton of overlap between fans buying at the pop-up shop and fans who will buy at actual record stores, but I know there is some. Why not do the pop-up a separate weekend in 2013? Because I had made brunch plans before my stance on the pop-up had changed, I ate at Bite with pals and, though I did venture into the pop-up shop next door, I did not buy anything. I bought a 7″ at Laurie’s Planet of Sound and a Monks cd and the Unrest mug at Saki. I also got to see a set by Bare Mutants, who I was very impressed by. Long live RECORD STORE day. Even in its’ short life, it’s become commercial with people standing in long lines only to hawk sought after stuff on eBay when they get home, but what’s wrong with having a day to celebrate the shops that mean so much to so many? Let’s leave RECORD STORE in RECORD STORE DAY. Let’s go back to happy news that Z just relayed to me off Facebook: Our friends Annie and Jason are engaged! Also, now that it’s past midnight, it is Annie’s birthday. Happy Birthday, Annie! Totally loved FRESH. I know, I know. How many documentaries about how much better locally-grown food is for us vs. processed crap can I watch, right? Zachary won’t even watch anymore of them with me, HOWEVER, I learn from each and every one that I watch. This time I learned about Growing Power, which I feel silly for not knowing about, being so close to Milwaukee. This documentary was not as flashy as Food, Inc. which I also loved, but it was definitely worth watching; lots of beautiful, happy animals and passionate people. I love these things. Super productive week. Got my taxes done and saw that One Strange Bird was right across the street, so I finally dropped in. Awesome little shop. Because of stopping by, I made the connection that a class I had been considering taken was taught there! 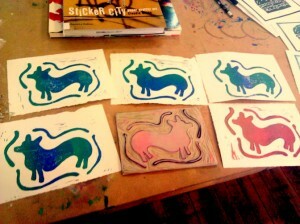 So, on Saturday, I took my first Dabble class: Linocut printmaking taught by owner Nicole Northway. The above photo is a picture of the lino block I carved and the prints that resulted from it. I predict many lino blocks in Rhymes with Twee’s future. At work, I noticed that one of the screws from my glasses was coming out and a simple tiny screwdriver wasn’t cutting it. I ended up having to drop in to Labrabbit, where Coyote fixed them! Coyote also showed me great frames made in the USA! CIMMfest made it possible for me to see the film Three Graces that ADULT. made and then played the score live to. It was unnerving; like Matthew Barney meets Alejandro Jodorowsky but with a 99% female cast. 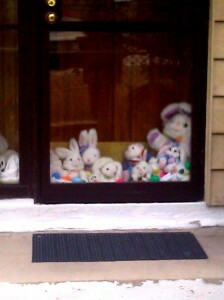 Though I was certain I was going to have nightmares afterwards, I somehow avoided them. I am watching Today’s Special right now and I need to go eat some Indian food ASAP. 2012 Week 14: Happy Anniversa-twee! Z and I celebrated our 6 year anniversary twice this week. On our actual anniversary (Monday), we went to our beloved Bite because we wanted to do something on the actual day and it was lovely, as always. 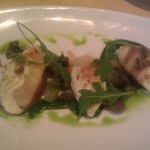 While we were in the DC area for the Chickfactor shows, we went to a fancy dinner at Birch & Barley. It was one of *the* best meals of my life. Stuff of dreams was my appetizer: ricotta dumplings wrapped in duck prosciutto with fried capers and olives and there are two elements I am missing. Creamy and salty and the texture was just amazing. 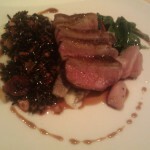 Duck as my entree was excellent also, but I wasn’t wild about the wild rice on the side. 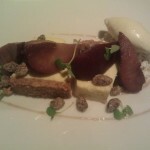 The goat milk cheesecake was flawless. One of the pricier meals we have eaten, but definitely worth every single penny and then some. Photos are above. You should probably have a napkin handy to wipe the drool from your mouth. RE: Chickfactor at Artisphere (Arlington, VA). Seeing Stevie Jackson and Black Tambourine were the highlights for me. Spending time with Z and my family and friends this weekend was fun-filled and we ate and drank like kings every day. Truth: I ate duck Friday, Saturday, and Sunday. We got a nice long walk with my parents in over the weekend, but not much other exercise. We are definitely going back to Lean Cuisines and Wii-ing every day this week! Being so busy, we didn’t have a whole lot of time to watch films, but all of them were enjoyable in their own way. This is definitely a must-watch doc and it’s on Netflix instant viewing! 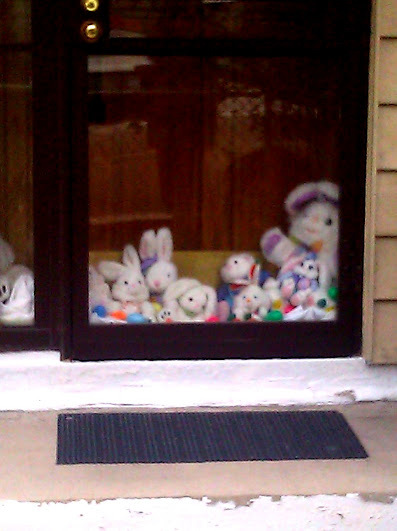 These bunnies were spotted wreaking havoc in the neighborhood. Police are advising keeping carrots on your person at all time to distract them from attacking. Lots of awesome friend’s birthdays this week. I failed at being able to sing Billy Bragg’s ‘A New England’ at my friend Megan’s birthday, but I succeeded later in the week. I applied for my first craft fair of 2012 this year; for Urban Folk Circuit @ Schubas in May. Cross your fingers! I’m fighting against a cold I’m pretty sure that was tipped off by biking to work on a freezing day dressed inappropriately. Lately I’ve been researching natural remedies rather than reaching for a medicine first. So, for my sore throat I’ve been gargling and then drinking water with 1/8 tsp of cayenne pepper. It actually chases away some of the soreness. As a result, haven’t gotten to work out very much for the past few days. Tomorrow is Zachary and my 6 year anniversary! Next weekend we’re heading back to DC for the Arlington, VA Chickfactor show to celebrate. It’s great to be in love with your best friend. This week, I watched a great deal of Shark Tank and not a lot of films. Gates of Heaven was my favorite of the week. It is a charming documentary and I connected with many of the people interviewed about the deep connection they felt to their pets. I was actually surprised to know that pet cemeteries have been around that long. In Time was a great premise, but it fell short. I felt like part of the film was yanked from one of my recent faves Timer.